Discussion in 'Downhill & Freeride' started by nvd, Dec 22, 2007. Appears DeJesus has been busy. Here are a few pics of me racing my 1997 EWR E-Motion Race frame (tripple butted True Temper OX-III) JrX cross country late 90s at the Micheaux Ironmasters Classic in Pennsylvania. 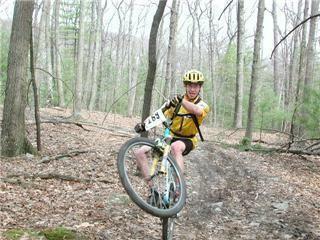 I know I have some sweet old school dirt jumping and slalom pics kicking around somewhere too. When I find them I'll post em up. 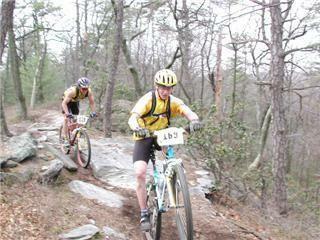 I still have the bike and ride it on singletrack all the time. Now she's a single speeder tho. Word on the street is they are making special runs of the classic designs with updated geometries and disc tabs. iii Viva la EWR !!! This is very cool. When I bought a Breezer in 94, it was between the Breezer Lightning, an EWR and the cannondale M800" beast of the east." Where are the pics? Did Chris have one of those as well? yeah, chris and I both rode them all through high school. We'd probably be working office jobs somewhere if it weren't for Jay and the rest of the Eastern Woods crew. I found a handful of really cool slalom pics last night from Seven Springs and Mout Snow in 1999 and 2000 on the courses that DeJesus, Ebbot, and Chase built. I'll get them scanned and posted at some point. comes to 24 lbs even with Marzocchi and Maguras, so whoever said they are heavy is full of crap, it's the lightest bike I own. Took me almost 10 years to gather all the parts and finish dialing in this bike, but she's finally done. That is cool Nick. Sounds like a christmas list of parts you have on that thing! I just rebuilt my EWR Original Woods Bike with X.9 and a White Bros. fork, and I am right around 26 lbs. Not bad at all. I always get people asking if they are heavy, and they aren't. Are they the lightest out there? No. But they definitely are strong and reasonable in weight. I attached a pic, and a bonus pic. It's Jay de Jesus' business card from back in the day. rock & roll, praise the cycling gods, the OG is back. This thing is going to ride like a blkmrkt mob for the singletrack! very cool purple specimen Kenn!